Edison Dental Arts is pleased to offer an alternative to metal braces, the Invisalign® system, to meet the needs of patients in the Edison area. Invisalign is a system that uses thermoplastic trays to gently move the teeth and jaws over time. At the beginning of treatment, you'll be given a series of trays to use as your teeth gradually move into the correct position. The average length of treatment is 1 year, though more or less time may be required, depending on the complexity of your oral health concerns. How Is Invisalign® Different Than Clear Braces or Metal Braces? Metal braces and ceramic clear braces involve the use of wires and brackets that are bonded to the teeth and left in place until they are removed by an orthodontist. Even ceramic clear braces can detract from a person's appearance, and both types of braces can make it difficult to eat, brush or floss. 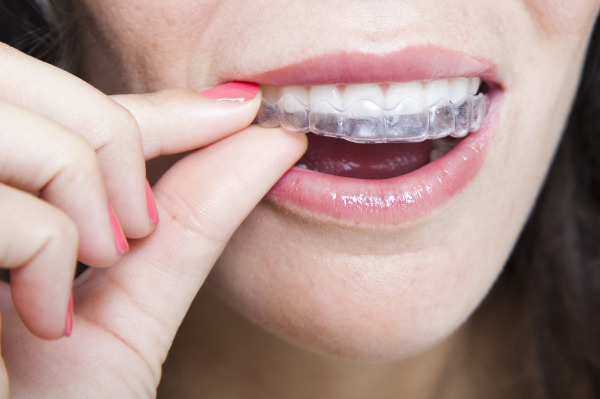 Invisalign® trays are different from braces because they disappear almost completely when in place. In addition, they can be taken out while eating, brushing or flossing. This allows you to maintain your normal at-home oral health routine and decrease the chances of gingivitis and tooth decay developing due to difficulty cleaning around oral appliances. We are a proud Preferred Provider of Invisalign® in Edison! Our expertise working with Invisalign® ensures that you get the comfortable treatment you need to correct complex oral health issues. Is Orthodontic Treatment Really Necessary? • Poor chewing due to uneven bite - Causes excessive wear and tear on the teeth that can lead to the need for dental work in the future. • Increased risk for gum disease - Gaps in the teeth and crowding in teeth provide places where food can become trapped. Correcting misalignments can lead to healthier teeth and gums and less time spent in the dental chair in the future. Our Edison Invisalign® dentists can help you avoid complex oral issues and improve the look of your smile with clear aligner therapy. What Should I Look for in an Invisalign® Dentist? When selecting a dentist for Invisalign® treatment in Edison, it's important that you choose a dentist that is an Invisalign® Preferred Provider. To qualify for this status, a dentist must complete specialized training, making him or her an expert in fitting and maintaining the aligners. Edison Dental Arts is proud to have Invisalign® Preferred Provider status. We have the technology and experience necessary to develop the best treatment plans for every patient. Can an Edison Invisalign® Dentist Help Me? The only way to know for sure if Invisalign® is a viable treatment option for you is to be evaluated by a dentist who is an Invisalign® Preferred Provider. Contact Edison Dental Arts today to schedule your Invisalign® consultation and find out if clear aligner therapy is right for you.